If you have some outside space it is important that you are using it; don’t be afraid to spend time outside in your garden, yard or even balcony. It is surprising how good for us getting outside is, it is nice to feel the sun on the skin, but it doesn’t really matter the weather, getting outside and enjoying living is important. If you don’t have a garden it is still important to get outside into the fresh air, it wakes you up, it makes you feel good and it is good for your health and mental well-being. If you do have the benefit of an outdoor living space, making the most of this area is important, I spent nearly 2 years finding it difficult to get out in my back garden, it has taken time and I am now beginning to get back the ability to just go outside and enjoy the garden. It has been a slow process, I have had to take back control of this space and it has been good for me. I am able to go outside in the garden, just sit there, and enjoy the outside. This has positive health benefits for me and it can help you too. Protecting the outside spaces that are available for people to enjoy is important, whether it is your own garden or a local park, getting outside has positive health benefits. Our bodies need the vitamin D from the sun and it has positive benefits to a person’s mood too. I like to dry clothes outside, it is free and it is a great way to save money on electricity costs. The best is an outside dried towel; they are rough and much nicer than a soft fluffy towel dried in the tumble dryer. I think for me, the smell and the feel of them remind me that I have saved money and that is important. If you have space outside, there is always to growing things to eat, saving you money on your grocery budget. My gooseberry bushes this year, I have just two, produced nine pounds of fruit and this is fantastic. My rhubarb patch is growing well too. This helps with my grocery budget as I am able to make different dishes with the fruit and it lasts into the winter as I stew them and freeze them into meal-sized portions. 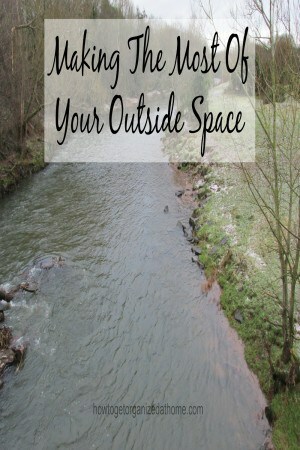 It is possible that you don’t have any space which you can call your own and this is OK, it just means that you have to find somewhere that you like to go, to get outside into the fresh air on a daily basis. If you have a dog, it is a great excuse for getting outside and just going for a walk. It gives you the pleasure of the outside and a purpose and this is important to encourage you to get outside regularly. It is good for your health and mood to get outside and start enjoying the outside. Therefore, if you are not using your outside space to your best advantage, then you are wasting a precious resource that you have. It can help you feel better and it could potentially give you opportunities to save money with growing your own food or drying your washing. If you are looking for more articles on this topic head over to the landing page where you will find links to other articles on lifestyle. I’m so happy to have several flower bushes at my new home. It’s wonderful to look at them and smile, knowing they are mine. Plus they provide no end of fascination and pleasure to my grand baby.